On a cold, dark night in January, Date Night wants something simple, like pizza and cheap beer. 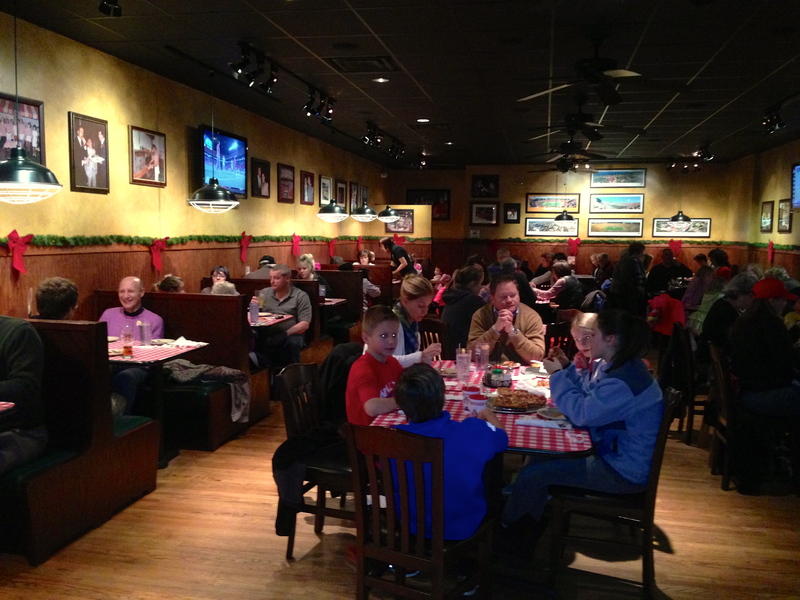 Tonight, we do it “Chicago-style” at a pizza place just a couple of miles from Date Night headquarters in Marietta. 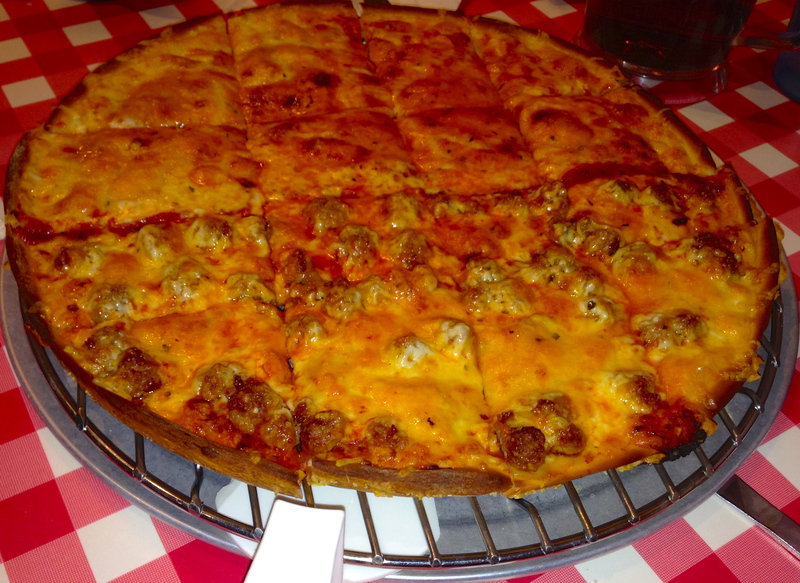 Ask anyone from Chicago-land where they eat pizza, and they will probably tell you that Aurelio’s is where they roll. We know some people in Conyers that drive 50 miles each way just to eat here. There are 40 branches of the chain, mostly in Illinois and Indiana. You can tell it’s a “Yankee” chain because, as we hear many embarrassed servers say, “We only sell Pepsi products.” This is the only Aurelio’s in Georgia. There are comfy booths and tables. By 7:00, they are waiting for tables on this wintry night. A good idea: there is a separate to-go counter/cash register where you can pick up your pizza without having to deal with anyone in the dining room. We are joined tonight by our solo offspring, who is home for one more weekend before returning to college. We order beer off of a short, six-beer list. Yuengling amber is the only beer on tap. The most exotic beer on their list is Red Hare lager in cans. Otherwise, there’s just “convenience store beer”. 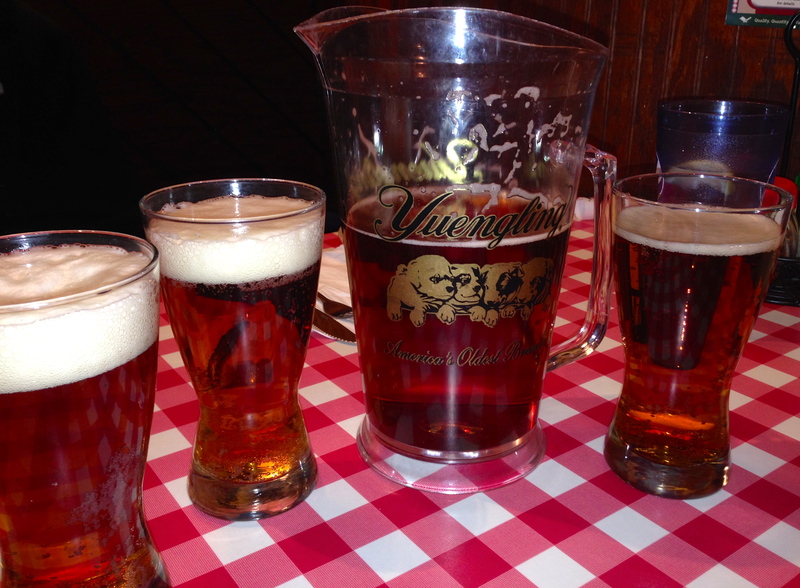 The Yuengling has a hint of malty flavor, and it’s inexpensive. We get six glasses of beer out of the pitcher for under $14. Next, a citrus salad is split three ways. 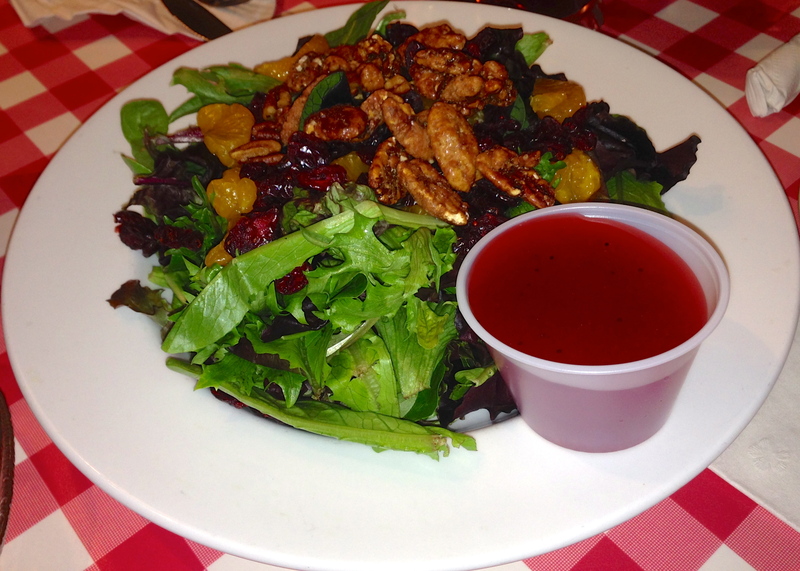 The mixed greens come with craisins, oranges, and glazed pecans. This is a huge salad and it could be divided at least four ways. The pecans are a nice touch and infuse a bit of sweetness with the raspberry vinaigrette dressing. Most Chicago pizzas are thick-crust or stuffed. 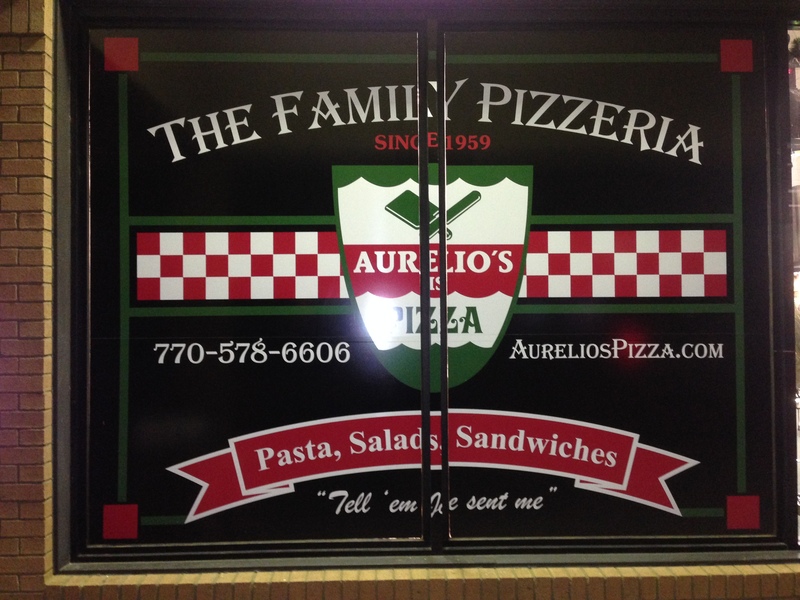 You can get those here, but Aurelio’s is famous for their thin crust pizza, and we order one. The #9 is half sausage and half cheese and all good. It’s salty, hot and a little greasy from the cheese, just the way we like our pizza. This 13″ crispy-crusted circle (Date Night never charges extra for alliteration) is more than enough for three people and we get leftovers for another day. One of the house specials is the Calabrese, which is Aurelio’s take on a calzone. Elliott orders the small with spinach and meatballs. This is the “dish of the day”. 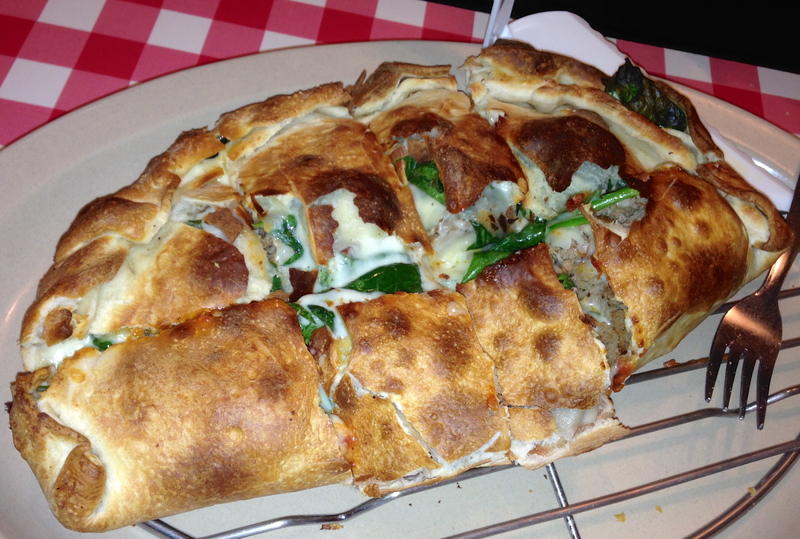 It’s like eating a giant meatball sub, but it’s in a pizza crust instead of a bun. It’s really good, much better than the pizza, and the kitchen has browned the crust to perfection. We take some of this home too, sure that Elliott will enjoy the snack later this weekend. There is no dessert on the menu, which keeps us from having to decide if we want it. There is a Yogli-Mogli a couple of doors down in this shopping center, but we are too full, and it’s just too cold. Later, we spoon our own in our warm, toasty home. Have you tried this “frozen dairy dessert”? 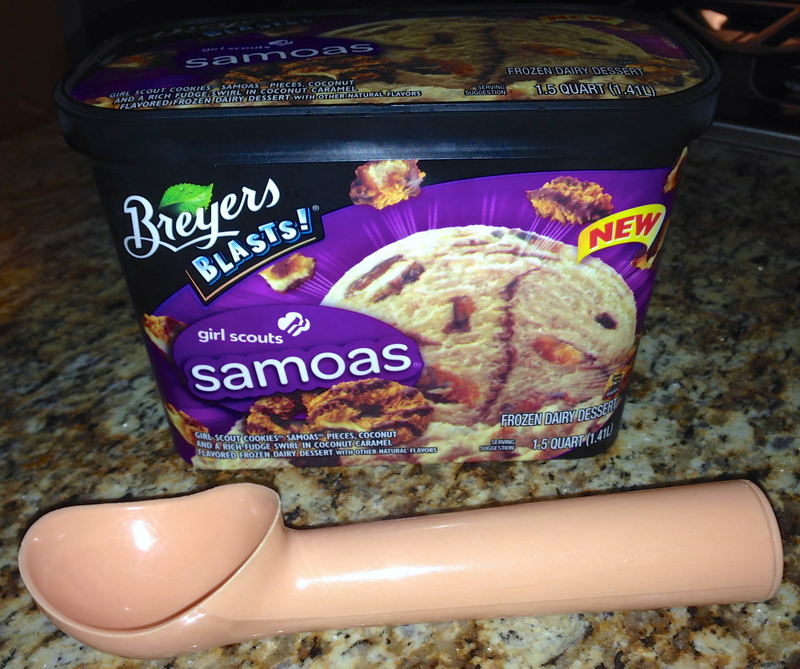 Someone found a great use for broken Girl Scout cookies. Available in Thin Mint as well, which Eve is dying to try. 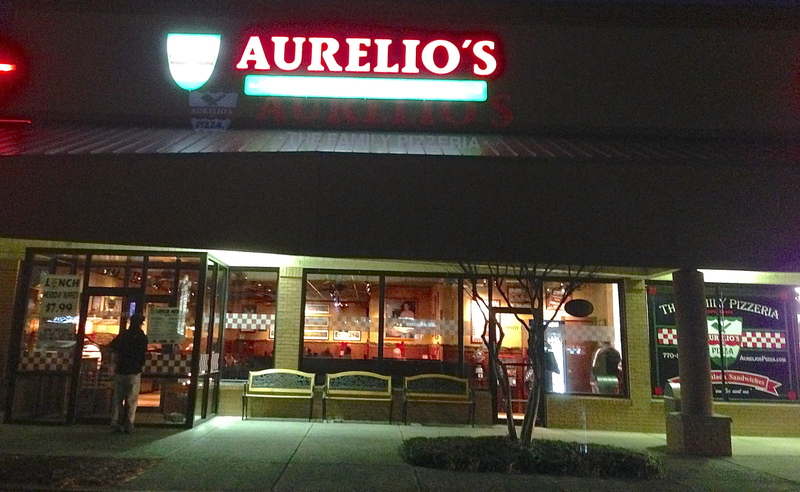 The Bottom Line on Aurelio’s: We enjoyed our meal at Aurelio’s and liked their take on pizza. There are many variations of crust and toppings on the menu, which makes your pizza ordering possibilities almost endless. The next time you want it “Chicago-style”, check out a place where fans of “Da Bears” like to eat.